Despite the fact that it became clear to me Jim Mora was not the answer as our head coach, I was surprised to hear he was fired today. I respected Mora’s sincerity and passion for the franchise and for the game. I think he brought in some serious defensive coaching talent in Gus Bradley and defensive line coach Dan Quinn. I think he made a fatal mistake in bringing in an offensive coordinator that installed a completely new system. As much as I love Matt Hasselbeck, he is a system quarterback. He does not possess a cannon arm and pinpoint accuracy that would allow him to just sit back, pat the ball and then gun it to the open receiver. He relies on timing and familiarity with the system and his receivers. When that is in place, he’s a Pro Bowl QB. Without it, he is forced to rely on his modest physical talents and the results are often mediocre. I also believe Mora rode Julius Jones, and even Edgerrin James far too long when he had a superior back in Forsett ready to take a larger role from day 1. Say what you want about the bad offensive line. Forsett consistently found more yards behind the same line. Not seeing that and taking advantage of it was a coaching mistake. 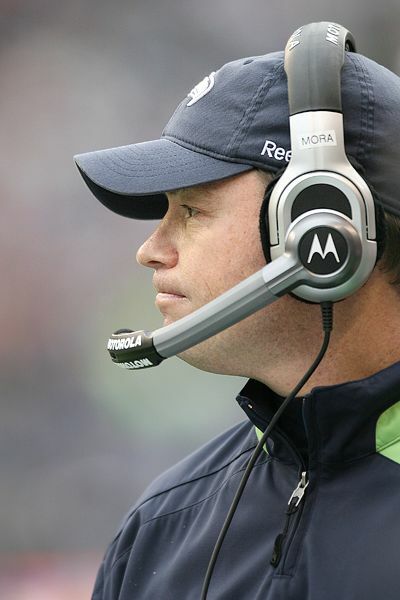 I had resigned myself to the fact that we’d have at least one more wasted year with Mora as coach before moving forward, so in that sense, I’m happy the Seahawks realized we needed a new direction now. I applaud them for making an unconventional move. However, this move without an absolutely clear upgrade in place concerns me. Reports are bouncing around the interweb that Pete Carroll is coming here. I can’t say I’m blown away by at possibility. The guy has impressed me with his recruiting (mostly irrelevant in the NFL) and his development of assistant coaches (tons of respect for Sark). Carroll has won championships, albeit at the college ranks, which shows me he can get a team to the mountain top. However, his USC teams were known for blowing their championship chances each year with a shocking loss to a lesser opponent. I want the Hawks to hire someone who has an identity that we want associated with the team. What’s Carroll’s identity? If I asked you the same thing about Bill Cowher, you’d all say defense, intensity and smashmouth football. Jon Gruden brings intensity and a west coast offense. I’m simply unsure what Carroll would really bring other than a recognizable name. If we were looking at college, I think I’d be more excited about Nick Saban. This all still brings me back to Mike Holmgren. Water under the bridge, I know, but does anyone feel like we are going to end up with a coach, GM and/or president better than Mike Holmgren at this point? Letting him walk may end up being comparable to the bungling of the Steve Hutchison contract. One thing we can say for sure is that we’ll have another season with a new system, likely on offense and on defense. Knowing what I mentioned earlier about Hasselbeck, I can only hope it’s a system similar to what Holmgren ran. Or, perhaps, this would begin the courtship of Matt Leinert as the Seahawks next QB as a free agent. Even the most optimistic Hawks fan could only say Mora deserved another year to prove himself. Most fans I spoke with were pretty sure he was not the answer. Anytime you prolong the inevitable, it’s a bad thing. Even moving on to another coach that ends up being bad is better than sticking with one you already know is.